There’s no way around it. We all live in a See-Through Economy. Social platforms like Twitter, Facebook, Glassdoor, and Yelp have empowered consumers to monumentally impact a company’s reputation. Gone are the days when PR teams could swoop in and keep a scandal under wraps. Corporate missteps of all magnitudes are now instantaneously shared, magnified, and multiplied. So, how can companies succeed in this see-through economy? It’s all about prevention. We believe performance is a result of effective risk management. Our enterprise risk management (ERM) software empowers organizations to anticipate what’s ahead, uphold their reputation, and improve business performance through strong governance. LogicManager is committed to helping businesses of all sizes across industries manage their risks proactively, and meet the expectations of their customers, employees, shareholders, and communities at large. Every company, no matter its industry, product, or service, impacts people like us. LogicManager is dedicated to helping businesses make this impact a positive one. In other words, we believe in good governance. 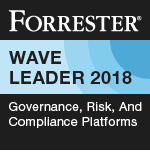 Good governance means holding each part of the organization to a high standard while empowering the enterprise to identify and mitigate risks before they materialize. In this see-through economy, consumers are truly empowered to speak out about what they expect from the companies they choose to support, recommend, and trust. Amidst the multitudes of corporate scandals dominating news headlines, consumers have come to expect good governance. Tragedies will inevitably happen, but tragedies are unforeseeable realities of life. Scandals, on the other hand, evoke the outrage they do because, unlike tragedies, they’re avoidable. LogicManager was founded on the belief that enterprise risk management is the key to preventing scandals. We’re fighting to make a change, and to provide the tools and services that make good governance possible. Most businesses manage their risks, but many need a better approach. LogicManager is here to provide a better approach to risk management. Today, LogicManager’s SaaS software and included ERM consulting service help businesses integrate risk, governance, and compliance activities so they can make proactive decisions that enable them to reach their goals. What makes LogicManager’s approach different? Many risk management solutions focus on separate areas of the business, managing risks associated with vendors and risks associated with IT separately, for example. While a business is comprised of its parts, these parts contribute to the whole, and therefore work interdependently. This means their risks are also connected. A risk associated with IT could very well overlap with a risk in vendor management. Our risk-based GRC solutions account for these interdependencies by giving companies an enterprise-wide view of their risk. If companies can understand which risks overlap and which risks are most impactful to their organization as a whole, they can streamline their risk management processes, and save time and money, while improving performance. LogicManager is a team-based organization. Our employees are creative, energetic, proactive, and intelligent in both their thoughts and actions. At LogicManager, there’s a shared desire to be at the forefront of innovation, and constantly bring real value to our customers across the world. We care about the work we do. We help businesses do right by themselves and by others. The decisions corporations make affect every one us, and it’s our job to empower businesses to make the best decisions. That’s why we get up in the morning. LogicManager takes pride in its dedication to a rewarding office culture, and is named a Best Place to Work by the Boston Business Journal, a Best Tech Work Culture by the Timmy Awards, and a certified national Great Place to Work®. In 2005, LogicManager CEO, Steven Minsky founded LogicManager, Inc. on the belief that performance is a result of effective risk management. Building on years of experience in risk and business process management, he saw that operating within silos hinders a company’s ability to make risk-aware strategic decisions. He realized an integrated, risk-based platform is needed to achieve strategic goals. Mr. Minsky built the LogicManager platform on a taxonomy technology designed to revolutionize how organizations approached traditional governance, risk management, and compliance concerns. Today, LogicManager’s solutions continue to empower companies to communicate and align their values across their organization, from the front lines to the executive level. From the beginning, LogicManager has worked with RIMS to advance the discipline of enterprise risk management. Steven donated his intellectual property and expertise to author the RIMS Risk Maturity Model (RMM). The RMM’s proven ERM framework and free online assessment tool have helped thousands of risk professionals across the world benchmark and expand their enterprise risk management programs.